We accept payments by cheque or credit and debit cards via the PayPal service. Please use the 'Buy Now' button and you will be led through the process of ordering. PLEASE NOTE THAT ORDERS FOR THE CURRENT ISSUE WILL NOT BE FULFILLED UNTIL THE ISSUE REACHES ITS PUBLICATION DATE (check the HOME page for date). The magazine is produced on a seasonal basis, four times a year. The publication dates are the first weeks of the following months: Spring issue-March, Summer issue-June, Autumn issue-September and Winter issue-December. Select the delivery location for relevant subscription price. We have sold out of all back issues except a few copies each of 36 (£3.50), 67, 68, 69, 71, 77, 79, 85, 86, 87, 88, 89, 90, 91, 92, 93, 94 & 95 (£5 each). Postage for all back issues is free to UK addresses (some postage will still be charged for delivery outside the UK. Please note that in some cases we have very limited stock, so it is worth checking with us for availability before ordering. Keeping up with modern technology, Groundtastic is now available as a mobile device compatible digital magazine. The new edition is now available to view at www.joomag.com. The addition of a digital platform widens the options for the magazine's readers, especially those that live abroad and have to pay a premium for postage of the printed version. The magazine costs less as a digital version than the usual cover price. Some older editions of the magazine are also available for purchase as digital versions. Excellent binders are available to hold six issues of the magazine. 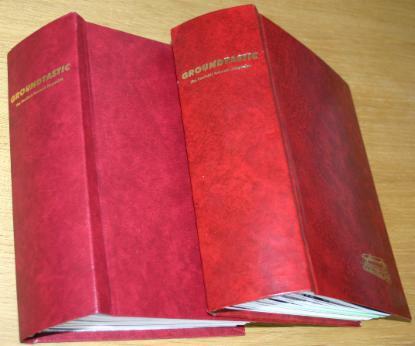 They come in a marble red effect with the traditional Groundtastic logo on the cover. Each binder costs £8.00 or £15.00 for two (UK), £9.00 or £17.00 for two (EU) and £10.00 or £19.00 for two (World) including postage. They are dispatched with instructions for use. Please email us for more information. A printed index of issues 1 to 80 is available. It comes in a 72-page bound book divided into sections of England, Wales, Scotland, Ireland, Europe, Rest of the World and Miscellaneous. Some 2,800 grounds are listed from 155 different countries. The index costs £6.15 (UK) or £10.15 (non-UK), inclusive of postage and has been produced by Peter Miles and is only available from him. He can be contacted by email at: peter_miles@blueyonder.co.uk. In addition to the magazine we have produced a series of quality postcards capturing the whole spectrum of grounds from defunct to modern and from multiple angle to aerial view. PLEASE NOTE: Some cards are now completely sold out. Each postcard measures 6"x4" and is printed on glossy card with yellow borders. There is a series number on the back with details of the subject matter. Each available card costs £0.50. Special rates apply for bulk orders. Please contact us with enquiries. Over the years we have published a number of books. Details of these are shown below. 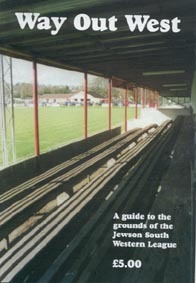 Published in December 2000 this book is a guide to the grounds of the Jewson South Western League (as it was then) and features all 19 member clubs within the 48 pages. 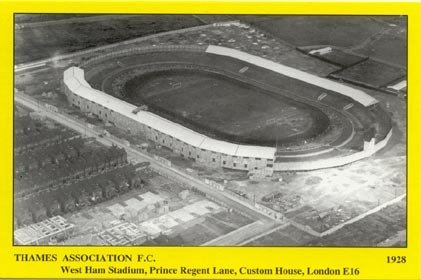 Each club has a two-page spread featuring two photographs of the ground, club details, a ground description, travel directions and a local map. It is an invaluable guide to the non-league traveller as well as a useful reference work for all those with an interest in football at this level. 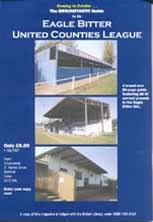 Published in October 2001, this was our third League Guide and featured the 41 grounds that made up the Eagle Bitter United Counties League. The format is enlarged to 80 pages and each club gets a two-page spread including two ground photos, club info and travel directions. Another book that will prove invaluable to the non-league fan. Other books published include 'A PICTORIAL GUIDE TO THE JEWSON (EASTERN) LEAGUE FOOTBALL GROUNDS' and 'BRAINTREE TOWN FC'S CRESSING ROAD STADIUM - A 75 YEAR HISTORY', both of which are sold out. Back Issues can be purchased using PayPal. If you would like to use this method e-mail us details of which issues you'd like to buy and we will send you a PayPal payment request for the correct amount. 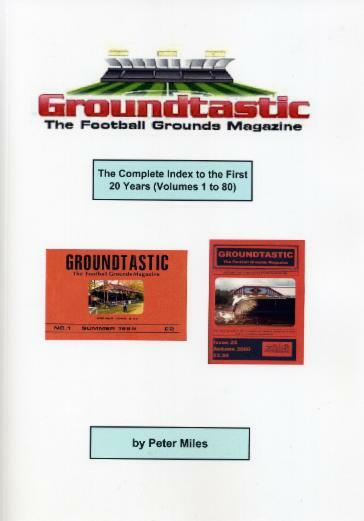 Alternatively you can write to GROUNDTASTIC, 21 Tiptree Grove, Wickford Essex SS12 9AL, U.K. Current issues cost, inclusive of postage, £6.50 (UK); £8.15 (EU); or £10 (World) . Orders by cheque or money order made payable to 'Groundtastic'.